Planting and growing peas may not be the most efficient use of space in your garden, but the flavor of home grown garden peas knocks the socks off most commercial peas. If you want more yield per square foot, grow snap peas so you can eat the pod and the peas inside. Pea plants are also great to include in your garden rotation because they can help add nitrogen to the soil. 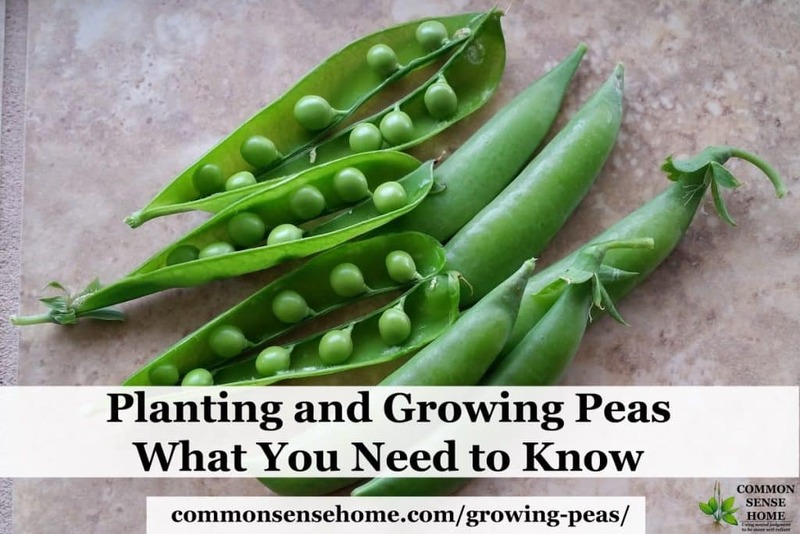 In this post we'll cover pea growing from planting to harvest, including garden pea companion plants, pea trellis and troubleshooting tips. Space between pea seeds: I prefer to plant in double rows about 8-10 inches apart, with a fence or trellis in between the rows and 2 inches between seeds. What are the Best Peas to Grow? My recommendation for best garden pea is Green Arrow. My favorite for best snap pea is Super Sugar Snap. I'm not a snow pea fan, so I rarely grow them. I regularly try different varieties, but these are reliable producers in my northeast Wisconsin garden (zone 4-5). If you're not sure what's the best pea variety for your garden, ask a nearby friend or neighbor what grows well for them in your area. Traditionally peas are one of the first crops planted in spring, but cool soil means a slow start to pea growing. 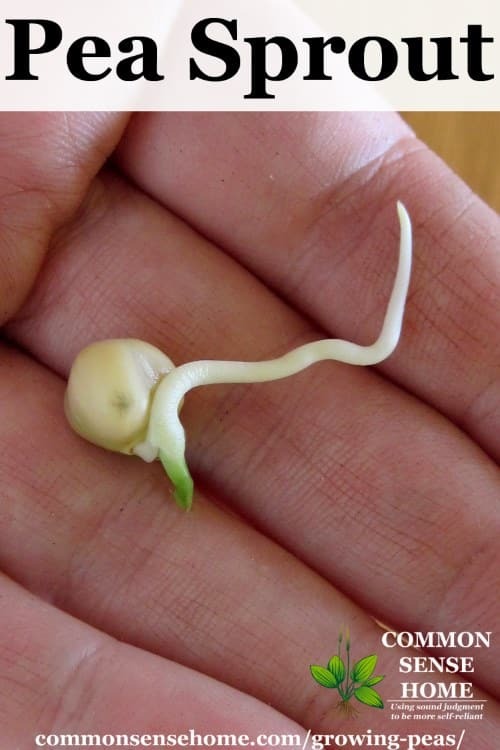 Soil that is too cold and wet may cause peas to rot instead of sprout. In The Vegetable Gardener's Bible, the author notes that germination went from 9 days in 60 °F (16 °C) soil to 36 days in 40 °F (4 °C) soil. Better to wait for the soil to warm up a bit before planting pea seeds, or use some dark landscape fabric or plastic to warm up the ground first if you're in a hurry. Once established, garden peas will tolerate cold, but not freezing, temperatures. Pea seeds are normally direct sown in the garden, but I have had good luck with starting my first crop of peas indoors. The young pea plants are then transplanted outside after the soil warms. For indoor pea seed starting, plant seeds about 1″ deep and two inches apart in shallow trays. Follow basic indoor seed starting protocol. Harden seedlings and transplant the growing peas into garden while still small (2-3″, 5-8 cm) to minimize transplant shock. You can also soak your pea seeds overnight and sprout them in a mason jar or dish. Cover seeds with water and allow them to sit overnight. In the morning, drain the water. Layer them between moist towels in a shallow dish, or keep them in the mason jar covered with a damp cloth. Rinse daily. Once root tails appear, plant while they are shorter than 2 inches long. To have your garden pea planting area ready to roll, add some compost or aged manure to the bed in fall. Use in combination with a cover crop to protect the soil. If you use a winter cover crop like field peas, you'll introduce the nitrogen fixing bacteria that help peas grab nitrogen from the air and make it available to the plants. A fall crop of peas may be sown in late summer for fall production. Check your soil temp – remember that garden peas aren't likely to germinate if temps are above 75 °F. Mulch may help lower the soil temp enough for successful sowing. Try planting peas to the north of a tall crop for sun protection. 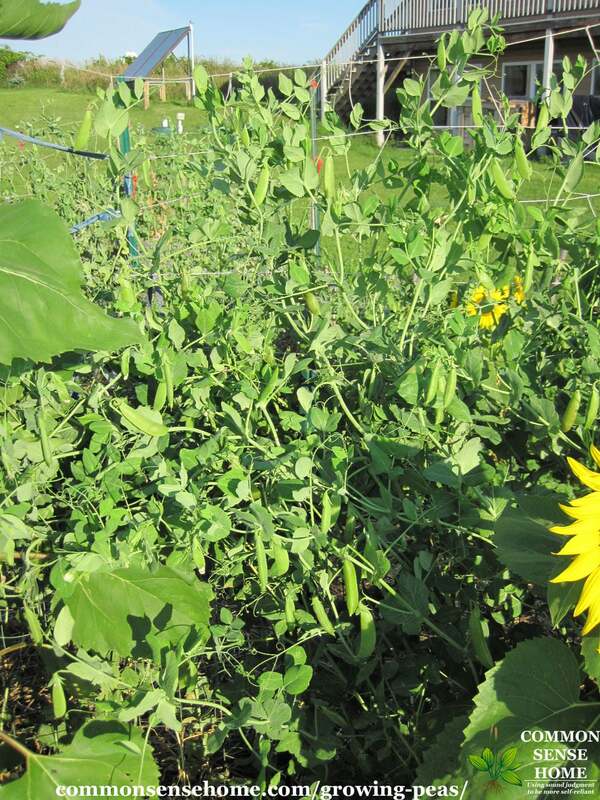 Southern gardeners may have better luck with peas as a fall/winter crop. See When Should I Start My Seeds? Printable seed starting calendar for help estimating your garden planting dates. I have cheated and placed onions along the south side of a row of peas at the edge of a garden bed to keep bunnies at bay. As long as the ground is fertile and the onions aren't too close, both do fine. Once pea seedlings are out of the ground, I mulch and trellis. It's helpful to have your trellis or fence up ASAP, so your young plants don't become a tangled mess. Waiting to mulch until the seedlings emerge keeps the soil temperature warmer for faster germination. For pea mulch, I lay down damp newspaper and cover with straw. The newspaper dramatically reduces the number of weeds that get through the mulch. You can use any organic mulch, such as old hay or leaves. Just watch out for herbicide or disease contamination. (Note: Uncomposted manure may also be a source of herbicide contamination if the farm animal it was from ate plants sprayed with herbicide.) Old hay may also contain viable seeds. Keeping the soil cool around your pea plants will help extend the pea growing season. How tall should a pea trellis be? It depends on which peas you're trying to grow. My preferences are listed below. How do you grow peas on a trellis? The peas should do most of the work for you, as their tendrils naturally reach out to grab and pull themselves up on available supports. I like to get my pea trellis in place shortly after the baby pea plants emerge from the soil. I plant in a double row and mulch between the two rows, and then place the pea trellis between the two rows. That way the weeds are kept down around the trellis, where they are difficult to reach. Guide pea vines onto the pea trellis as they grow, if needed. If a vine goes too far off course, use a soft strip of cloth or loosely tied twine to tether it back onto the pea trellis. For shorter pea varieties (3 -4 feet in height), I use a sturdy garden fence braced every 3-4 feet for a pea trellis. Strong winds (or the wait of full grown vines) will topple a fence that is less well supported. You might also try shorter folding garden trellis, or sticks with some twigs left on, but we get wind so I put up strong pea trellis. For taller peas (most snap peas and snow peas), I use trellis netting with fence posts and a cross support on top. See the Grow Pole Beans post for more detailed information. You can also try pea teepees, arches made from cattle panels, the VineSpine garden trellis or any other sturdy support you can rig up. See 5+ Terrific Tomato Trellis Ideas for a variety of garden trellises that can easily adapt to many crops. Do peas need fertilizer? After all, they can pull nitrogen from the air, right? It turns out that it takes a while for the pea root nodules to start working their magic to fertilize the pea plant. 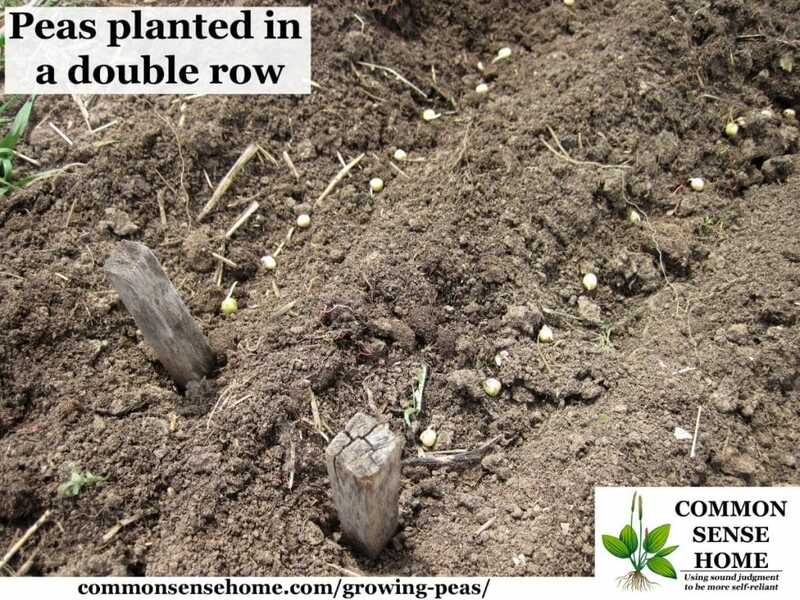 To get your young growing peas off to a strong start, side dress with some compost or balanced organic fertilizer when the plants are a few inches tall. Don't add too much nitrogen (like manure). This will cause plants to produce large vines with few peas. If mulched, growing peas do fine with about half an inch of water per week. Avoid watering in the evenings to reduce the incidence of powdery mildew, a common pea disease. Peas are self-pollinating, but benefit from bees and other pollinators. If you don't have bees or a breeze, gently shake the plants or brush the blossoms with a soft paint brush or feather duster. The flowers are edible, but you probably don't want to eat them as they turn into the peas. If you really want to eat pea flowers, just plant a lot more peas. Peas are susceptible to a variety of bacterial and fungal diseases. They can cause damage to the plants and the pods – even killing the plants. Work to promote good air circulation by keeping weeds in check and using plant supports. Mulching may help reduce soil borne diseases. Active compost tea can populate plant leaves so there is no room for problem fungi to grow. The healthier your pea plants, the more resistant they will be to diseases. To harvest your peas, use one hand to hold the pea plant just above the pea, and gently pull or twist the pea pod with the other hand to release it. You want to be careful to avoid ripping or tearing the pea plant. You can use scissors to clip the pea pod loose, but I've never felt the need. 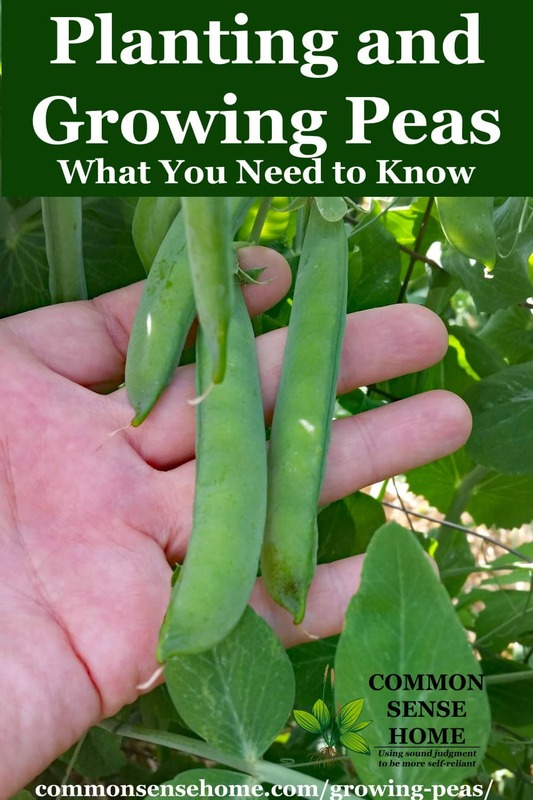 Determine when to harvest peas using the guidelines below for snow peas, sugar snap peas and garden peas. Harvest peas every one to two days once they start producing for best quality. If you find an overripe pea that was missed during an earlier picking, remove it. Overripe peas left on the vine tell the plant to stop making more peas. Note: Peas are best when eaten or processed within a few hours of being picked – especially garden peas. With longer storage, the sugars in the peas convert to starch. This makes the peas bland and tasteless. 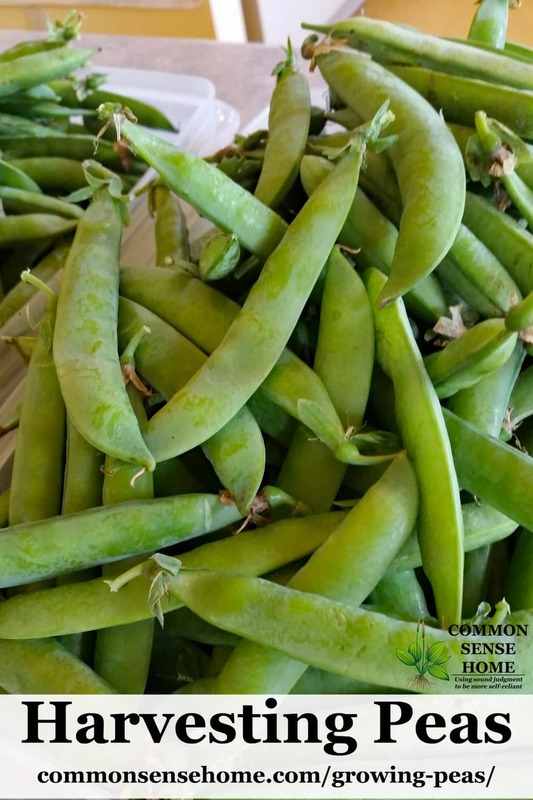 Snap peas and snow peas are more forgiving than shell peas, and will hold longer in the refrigerator. If you blanch your shell peas, you can stop the conversion to starch and save the flavor, even if you aren't eating the peas immediately. Harvest snow peas when the pod reaches full size but the peas are still tiny. Once the peas start to fill out, the pods get chewy. Harvest snap peas when the pods are full sized and filled with peas. Slightly overripe snap peas can be shelled and eaten like garden peas. The pea pod may look a little pale and fat, but the peas inside are still good. Remove the strings if needed, like you would on a string bean. Grasp the stem of the pea, snap it off, and pull the string off the side of the pea. Harvest shell peas when the pea pod is full but before it is bulging or wrinkled. If we find overripe shell peas, we sort them into a different container and designate them as “soup peas”. They are used in dishes like vegetables soup where the fresh pea flavor isn't as important. 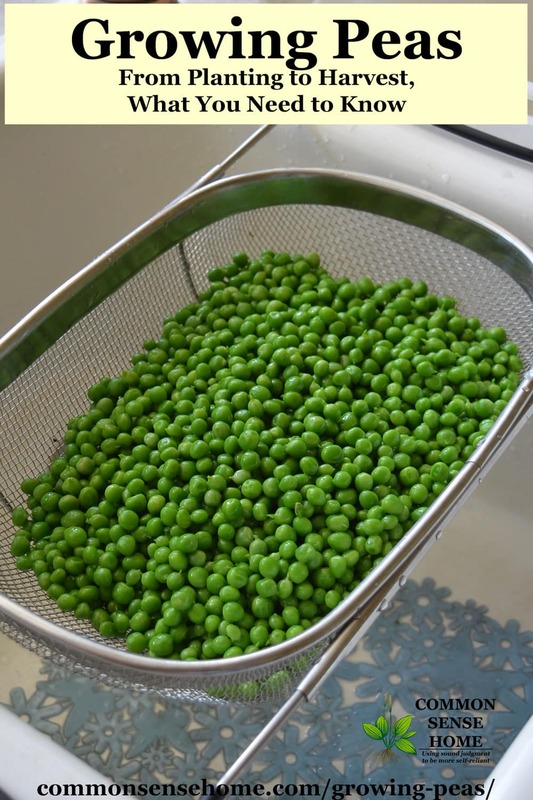 For more information, check out the post “Harvesting Peas and Carrots, and How to Freeze Peas“. Thank you for the great information. I started growing peas this year and will be implementing some of your advice to ensure a nice crop!